The instruments presented here are intended to give a brief 'snapshot' impression of the range of our output; a reasonably large number of images are placed throughout the website showing other examples of our work. 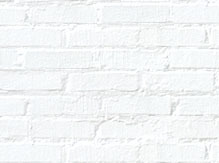 To avoid the inconvenience of your having to download huge files, we chose only to present a relatively small but representative selection of our enormous back catalogue of images here and in the rest of the website. We sincerely hope that you find the Gallery and the rest of the site helpful, informative and enjoyable. 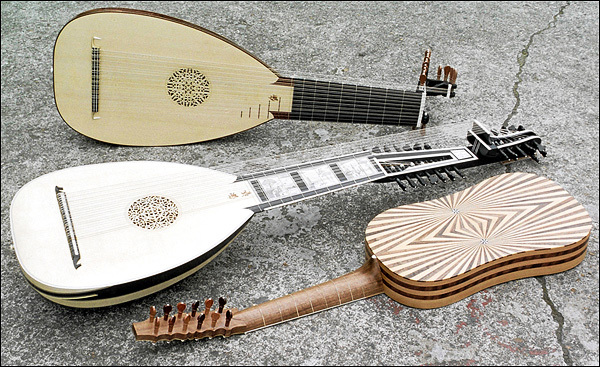 Above: at the rear, a 13-course baroque lute after Sebastian Schelle, 1744 which was made for Bob Venning, in NSW, Australia; in the centre a liuto attiorbato based on instruments by Matteo Sellas (this version has engraved mammoth ivory fingerboard panels) which was made for Noboru Kaneko, in Sapporo, Japan; and a vihuela which was made for Eligio Quinteiro, a Spanish player based in London. Bob wrote: "Many thanks to you both for such a beautiful instrument". 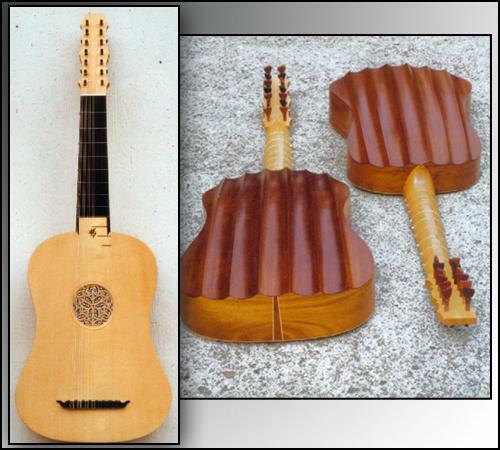 Noboru wrote: "My liuto attiorbato is a superb instrument; I cordially thank you for building me such an instrument; the instrument is very beautiful and attractive for me". 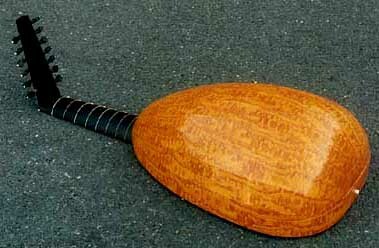 Eligio wrote: "The vihuela is the best I have ever played  truly. I have recommended it to my friend Jesús and another performer who is looking for one at the moment. Thanks for such wonderful instruments; you'll always have my respect and admiration". A 'signature' instrument from our workshop, the striking black and white timbers of this baroque guitar are ebony and holly; it is based on the only known surviving guitar by Jacopo Checchucci, who worked in Livorno; the original is dated 1623. 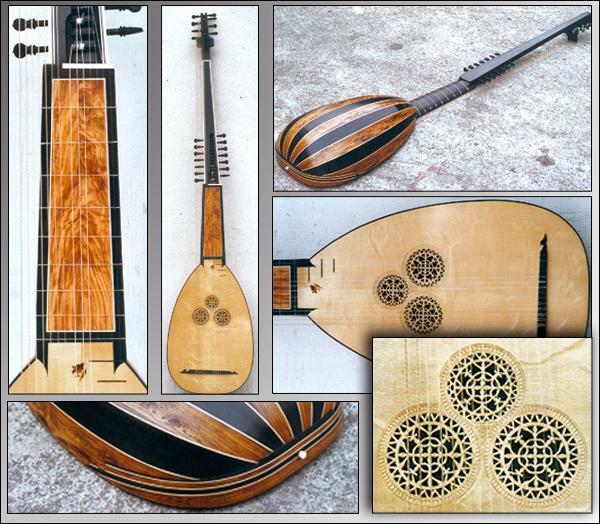 The image above was taken in our workshop, and shows a seven-course lute with a nine-rib back, which is made from four slices of Hungarian ash, sawn in sequence and bookmatched, striped with five ribs of a different cut of Hungarian ash from a different tree. In order to produce the curious light effect seen here, a strong light has been shone into the bowl of the lute, illuminating the ribs from within the lute's body (before the soundboard was glued in place). 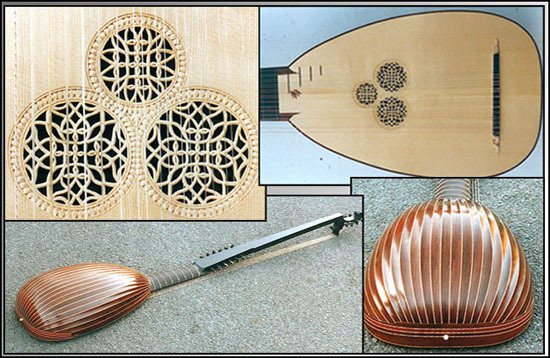 We think that the different way in which the light penetrates the two timbers  something which would not ordinarily be observed and in this case only made possible because the soundboard had not been fitted when the photo was taken  makes for a very interesting and unusual aspect of a lute, a striking image, and something that a player is not likely to encounter. (No. 11 & No. 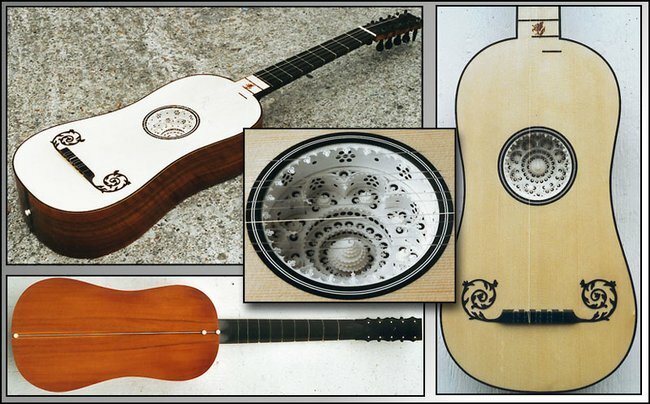 13 in the guitars section; the instrument nearest the viewer in each image is a copy of an Antonio Stradivari guitar of 1700, the ebony-sided instrument is a copy of a guitar by René Voboam of 1641). The one on the left has a back from 11 ribs of very highly-figured Hungarian ash, colour-varnished; the one in the foreground is made from figured walnut striped with figured maple, and the one on the right is made from two types of figured Hungarian ash. They are owned by players in England, Scotland, and Colorado, USA. 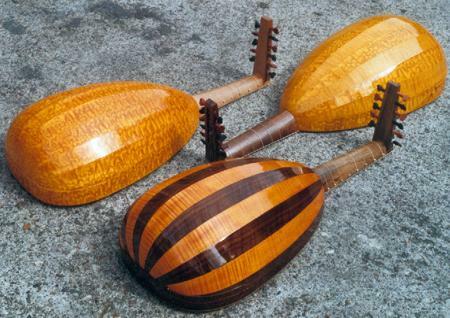 The front view above, and the one on the left of the pair lying face down is the same instrument, a 7-course version of the Chambure vihuela; the prototype, a 6-course instrument, is on the far right. Owned by a player in Berkeley, California, USA. A scene from a multi-storey vihuela park . 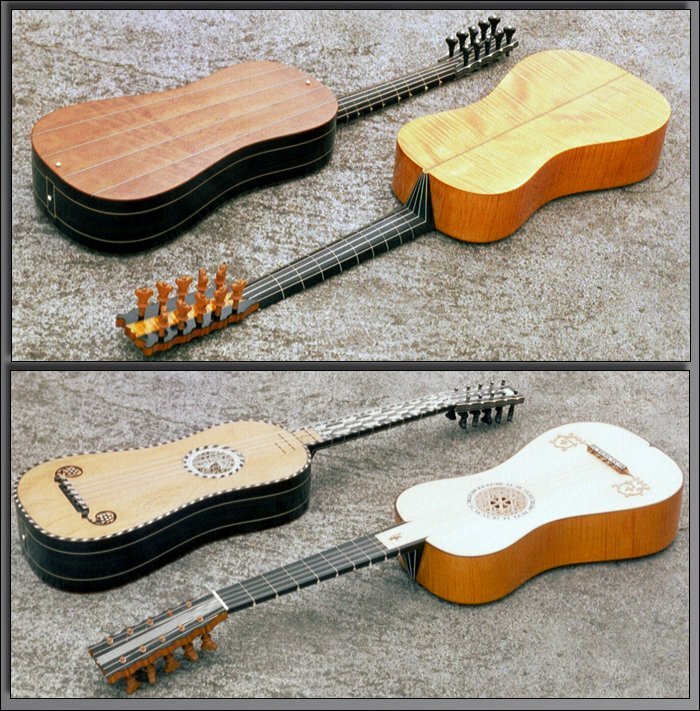 . .
Three versions of the 'Chambure' vihuela, top to bottom: the most recent version of the instrument, tuned to a', second 'evolution' version from 2003, and the original  and first modern copy of the Chambure  made in May 2001. 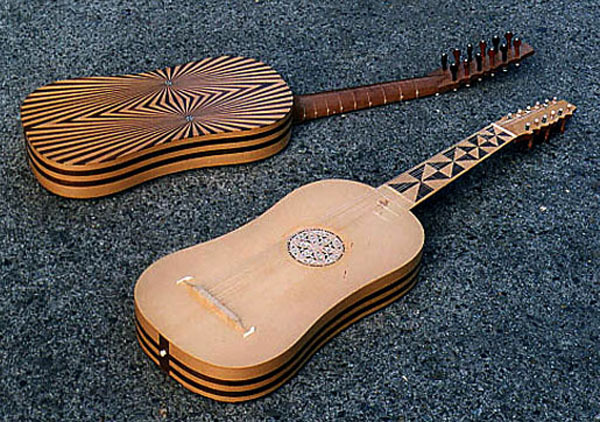 The a' vihuela and the original Chambure are made from mahogany, and the 2003 'evolution' version is made from walnut. We keep an example of each of these instruments here in the workshop for visiting players to play and compare. Back of 9 ribs in walnut striped with cypress, based on Cantigas MS illustration; gilded rosettes, ebony and bone detailing. 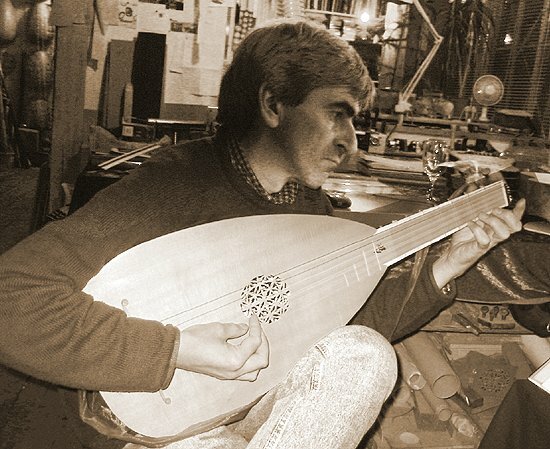 The 6-course a' lute shown above (originally offered for sale here in January 2002) was temporarily withdrawn from sale in April 2002 because it was on hire to a film unit on location in Coburg, Germany, where Luther - a film version of John Osborne's Reformation play Luther, based on the life of Martin Luther - was in production, starring Joseph Fiennes - who will be seen in the film playing this instrument, and can be seen holding it in the still from the film shown below. There are many contemporary accounts that testify to Martin Luther being a skilled lutenist. We were asked by the Berlin-based film company to supply an appropriate, authentic instrument for the period - because they could not source one in Germany - and we suggested this a' lute. 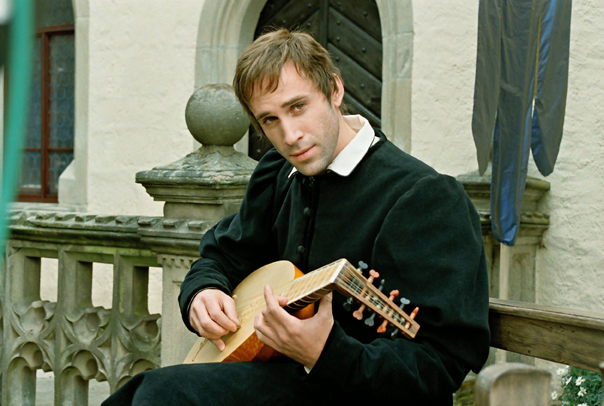 Joseph Fiennes was coached in lute technique for the filming by the lutenist Markus Märkl, a friend and customer of ours from MŸnchen; Markus commented that Joseph clearly had the potential to be a good lutenist himself, as he quickly grasped what Markus was showing him. Markus also ended up with a walk-on part in the film; Jennifer Lopez is rumoured to be after him for her next video. . . The lute was subsequently sold on August 6th 2002, to Scottish singer and lutenist Geoff Davidson; however, Geoff has recently decided to sell the instrument, as he is not playing it as much as he thought he would - having at the time of buying it from us last year also collected a 7-course which we rebuilt for him - he now finds himself playing the later repertoire, such as Dowland, rather than the earlier Milano and Dalza for which this lute is of course eminently suitable. The instrument is therefore currently for sale again. This still from the film shows Joseph Fiennes with the instrument on location at Coburg - note his little finger resting on the soundboard, as taught to him by Markus Märkl ! 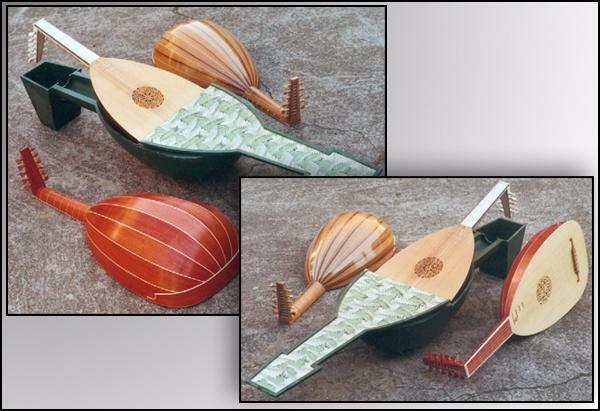 The lute in the green case was the first ever modern copy of the Magno dieffopruchar six-course lute from the Beare collection (formerly in Hever Castle) made by Stephen in May 1981, whilst measuring the original (which was open) in our workshop; the case - its design inspired by lute cases seen in many old paintings and engravings - is made of wood, with a felt lining to protect the lute back; the lid is lined with a marbled paper. The other two instruments - made in 2001 and 2002 - are made from pink ivorywood and servicewood; all three instruments are part of our permanent collection, in our workshop. Back from 11 ribs of very highly-figured Hungarian ash, colour-varnished; ebony-veneered neck and pegbox, ebony pegs with bone pips. 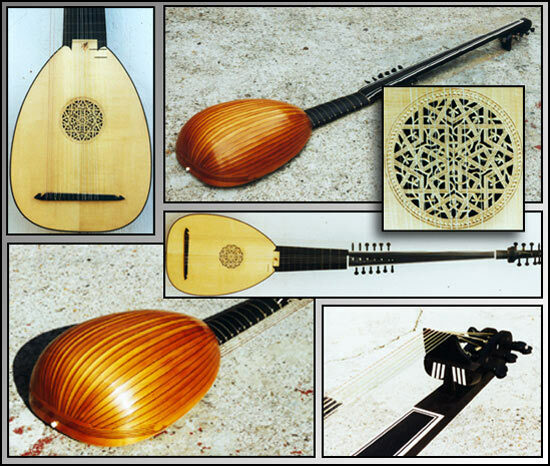 Based on a 6-course lute designed for The Lute Society by Stephen Barber in 1982. Owned by a player in Dresden, Germany. 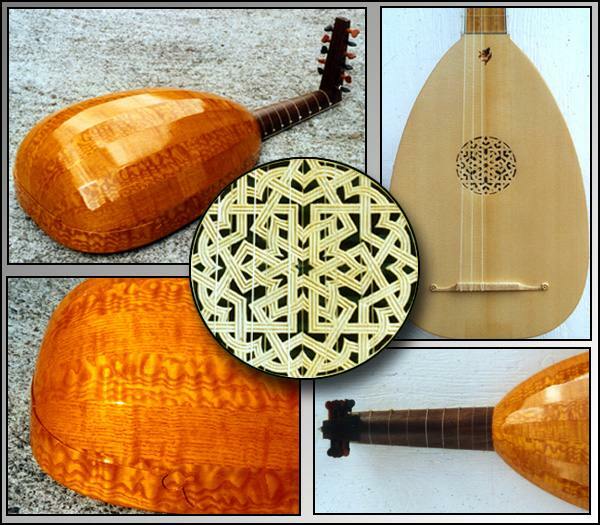 Own design, with 9 ribs of highly-figured birds-eye maple, colour-varnished, with an ebony-veneered neck and pegbox. Owned by a player in Catalunya, Spain. 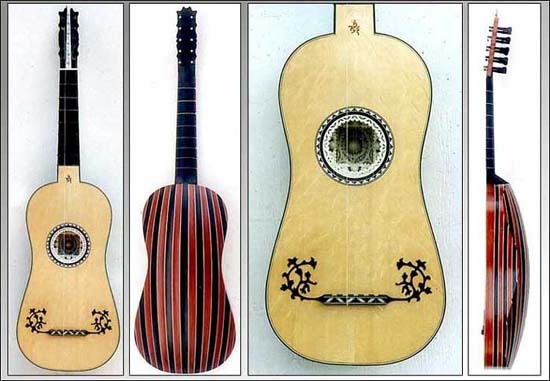 Own design, with 11 ribs of rosewood striped with ebony, triple rose, soundboard half-edged with snakewood; olivewood panelled fingerboard; ebony-veneered necks. Owned by a player in Alhambra, California. 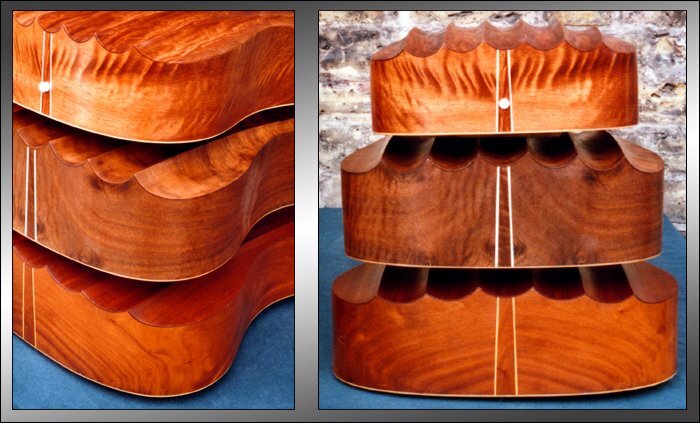 Own design, with 27 ribs of rio rosewood, triple rose, soundboard half-edged with snakewood; ebony-veneered necks. Owned by a player in Bremen, Germany. After Matteo Sellas, 1630, with 33 ribs of yew heartwood with ebony spacers, single rose, soundboard half-edged with ebony; ebony-veneered necks. Owned by a player in Houston, Texas, USA. Vaulted back (17 ribs), back & sides in red rosewood striped with ebony, with holly spacers; ebony-veneered neck & pegbox, ebony pegs with bone pips; spectacular, deep parchment rosette in 6 tiers; moustachioed bridge; haselfichte soundboard edged with red/white/green stripes. Owned by a player in Verona, Italy. 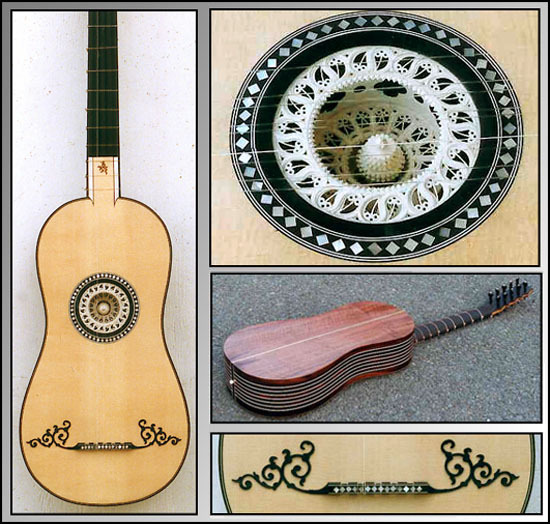 Marbled ebony sides and walnut back inlaid with holly; parchment rosette in 3 tiers; mother-of-pearl decoration around soundhole and atop bridge. Owned by a player in Bruges, Belgium. with cypress & walnut back & sides, rosettes in parchment & limewood. Owned by players in London, England, and Basel, Switzerland. 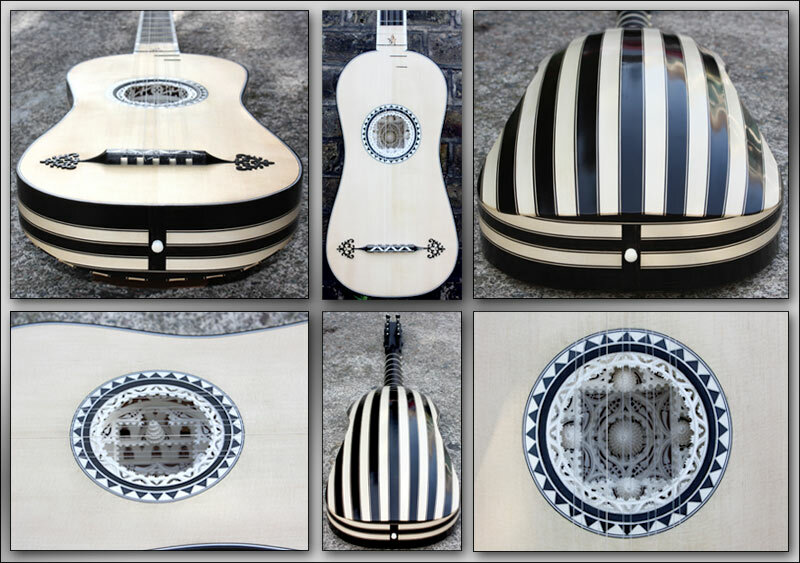 Cypress back with black/white/black (ebony/holly/ebony) stripes; figured walnut sides; ebony-veneered neck and pegbox; ebony pegs with bone pips; classic Voboam 4-tiered parchment rosette. Very clear and full sound, excellent for both solo and continuo playing - currently our most sought-after baroque guitar - Stephen Stubbs and Andrew Maginley are among buyers of this model in recent years. It works extremely well with gut stringing, and we've been recently using Nicholas Baldock's excellent Kathredrale gut strings. Our thanks to Richard Harris for the scanning and composing of these and all other images used throughout this Website. Photography by Stephen Barber, using a Nikon F301 35mm SLR with a Micro-Nikkor 55mm lens. Lost friends . . .
We were not able to regularly update our website for several months, or indeed operate normally towards the end of 2007, leading into 2008, because of the terminal illness and subsequent death on September 10th 2007 of Tony Harris, Sandi's father; Tony was diagnosed with cancer of the pancreas in early July 2007, following urgent admission to hospital in late June. We travelled as often as possible to visit him in the hospital, and then the hospice, where he spent his last weeks. We were able to visit most days, which was a blessing for us, but it meant a round trip each time of some ninety miles by car; as a consequence, our work was severely disrupted, and we were not able to properly function for several months, dealing with the illness and subsequent bereavement. Sandi was very close to her father, he was the original inspiration that kindled her interest in making musical instruments, and he was very proud of his daughter. The last time we visited him in the hospice and were able to speak to him, the day before he slipped into a coma from which he never awoke, we took a baroque guitar we had just finished (for Eligio Quinteiro) to show him; Tony sat up in bed, cradling the instrument, looking closely at it. Fittingly, it bears Sandi's pegasus brandmark. The look of pride and joy on his face will live with us forever. Many close friends and clients knew about the situation, but we also realise that many have been unaware, so we felt that it would be sensible to inform the wider circle of friends and clients who we have been unable to contact over this difficult period with this announcement. We apologise to all who have not known what has been going on, and who may have been concerned at not hearing from us over the last few months or so; we are sure that you will understand that this has been a very difficult time for us, and we are still grieving from the tragic loss of a wonderful, inspirational, kind man and true friend. We would like to take this opportunity to thank the many friends and clients who have sent messages and letters of condolence; Sandi is very grateful for these kind and sympathetic gestures, it helps at a time like this to know that people care. 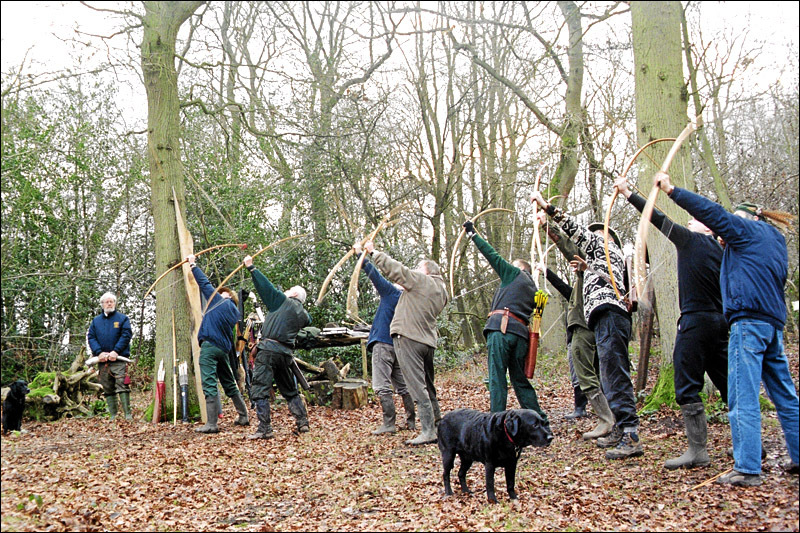 Above: the archers of the Medieval Society shooting a tribute at the scattering of Tony's ashes on December 30th, 2007, in the woods in Kent where  as a founder member of the Medieval Society  he used to regularly take part in archery practice and other events. Tony was a true 'Renaissance Man'. When we had to attend the local Registry Office to register his death, Sandi was asked his occupation; where do you begin? 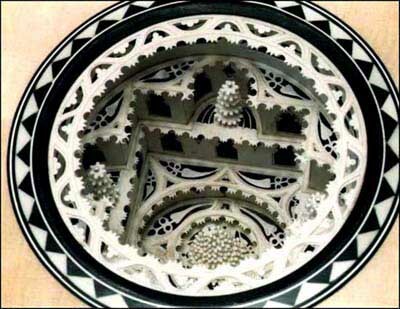 He had been a graphic designer and prototype maker (working for amongst others Loewy International and the Conran family), a jazz musician (a fine trumpet player and singer) and also a maker and player of Renaissance woodwind instruments (and member of The Canterbury Waits). Tony enthusiastically taught music to schoolchildren in Berkshire, and more recently in Kent. He was a maker of armour and replica weapons (he co-founded The Medieval Society in 1963, and acted as a consultant to the Royal Armouries at the Tower Of London and in Leeds). Tony was a fine horseman and a skilled archer with the English longbow; he had taken part in many jousting tournaments over the years with the Medieval Society; a strong man, he was the one who was usually asked to ride the most headstrong horse. Those of you who have seen Monty Python And The Holy Grail will have seen his swordmaking skills on show, including in the hilarious scene when King Arthur fights the Black Knight and ends up chopping off his arms and legs; he made many of the weapons used in the 2005 television series 'The Weapons That Made England'. Calling upon a completely different set of skills, he also helped build the motorbikes used in the first Angelina Jolie 'Lara Croft, Tomb Raider' film of 2003. The range and scope of his skills and achievements would be enough to satisfy the ambitions of many men and women; that he packed so much into one life  cruelly cut short at the age of just sixty-seven  and did so with his characteristic self-effacing modesty, only underlines just what we have all lost. Above: brass instrument specialist Dave Edwards, a long-time close friend of Tony's, blows a salute as the Medieval Society archers prepare to shoot a tribute of several flights of arrows. His passing has left an enormous void in many peoples' lives; we are grateful that we were able to spend a lot of time with him in his final months, and he will always be an ever-present inspiration to us. We know that it will be a very long time indeed before we meet anybody who can measure up to him. A great man, sadly and sorely missed. Sandi Harris and Stephen Barber, December 2007. More than fifteen years have passed since the tragic, unnecessary death from tuberculosis on August 3rd 2002 of the lutenist Tom Finucane, a very good friend who Stephen had known for 30 years. Tom was one of the most gifted and accomplished players of the lute, and among the generation of lutenists that arose in the late 20th Century, he was one of its most talented and sensitive interpreters, and the equal of any  a true musician's musician. He was a very warm, kind man, with a wonderful, wry sense of humour; a patient and inspiring teacher, he taught many players, including Brian Payne, who had started from scratch at the age of 28 and developed under Tom's guidance to play concerts at a professional level (there is a link to Brian's website on our Links page). Tom's playing and teaching touched and enriched many people's lives. He studied with Diana Poulton and Anthony Rooley, and his career as a lutenist paralleled my career as a lutemaker, we started out at the same time, and Tom was always an inspiring and helpful 'test-pilot'. We shared a flat for 6 years in the 1970's at 11, Flodden Road, Camberwell, south London, which became a focus for players passing through London. I'll never forget the first time we tried stringing a lute completely in gut (a medieval 5c lute) sitting in the long back garden: as soon as Tom began to run the plectrum across the strings, the 4 cats who were usually in residence legged it over the wall. The moggies must have felt they might be next . . . This portrait of Tom was taken by Anna Langley, while they were playing duets in our workshop in December 2001, during the annual open studios event held in Peacock Yard just before Christmas. "I happened upon your website today, and was distraught when I read of the death of Tom Finucane in August last year. I met him twice, once when he came to New Zealand in 1986 for the Early Music Festival, then a year later in London at a party. I am an amateur counter-tenor, and at that point a much-less-than-adequate one. It was a huge privilege for me to sing a couple of songs with Tom, most expertly accompanying me on lute. He was so kind with my rendition of a song whose first line was, appositely now, 'Ahimè'; I also remember his wry sense of humour - he continually made everyone laugh". Laurie Fleming, Wellington, New Zealand. "I was absolutely appalled to read that Tom Finucane had died. It is difficult to know what to say. I remember him well and when I think of him, I remember someone with a wonderful and rather wicked sense of humour. It is so sad; he was far too young. A part of my fondly remembered, London past . . . it doesn't seem possible. I know you must be very sad, Stephen. Please accept my condolences." "But for anybody who knows the work of the New London Consort, this disc will be a particularly moving experience because it begins with gittern (short-necked lute) playing by Tom Finucane, who died of tuberculosis very suddenly this summer. Many times in the course of the disc one marvels at his peerless musicianship; and in the duets with the harp of Frances Kelly one can hear the results of more than 20 years making music together. We shall miss Tom badly". Quite. Thanks to Craig Hartley for forwarding this quote.